A new Sweet Tomatoes opened up a few minutes from my place probably 6 months to a year ago. I had been wanting to try it for a while, but my laziness and the fact that panera bread was closer, always prevailed. For those of you not familiar with Sweet Tomatoes (or Soup Plantation in some markets) its an all you can eat salad, soup, baked potato, bread, sundaes bar. My friend Jen was in town and we decided to check out Sweet Tomatoes for lunch. I felt like a total amateur in that place. You walk in and all you see is the salad bar. Not knowing that there are many many more things on the other side, I load my plate up with all kinds of salad goodies. You pay and then you turn a corner and OMG there are soups, baked potatoes, and even an ice cream sundae bar. 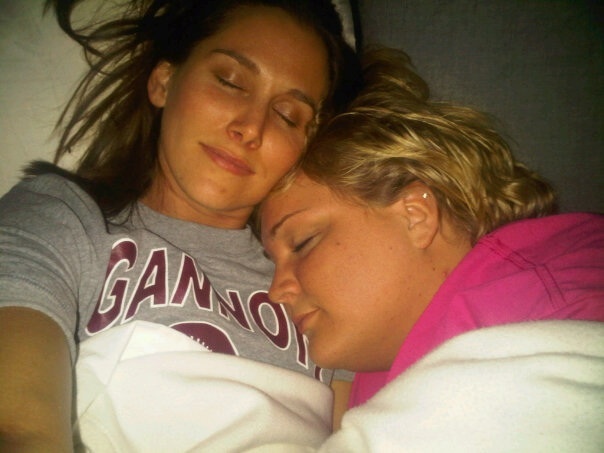 Here’s a pic of Jen and I snuggling on one of her other visits to Vegas. So I ended up getting a salad with spinach and a lil bit of romaine lettuce. Topped with olives, kidney beans, feta and blue cheese, croutons, bacon bits, sunflower seeds, carrots, and balsamic vinaigrette. I also tried a chicken soup that was just meh, nothing special, but I prefer creamy soups. The corn bread was decent, but the best bread was the pizza like bread. I could of eaten 10 pieces, but instead I just had 1. 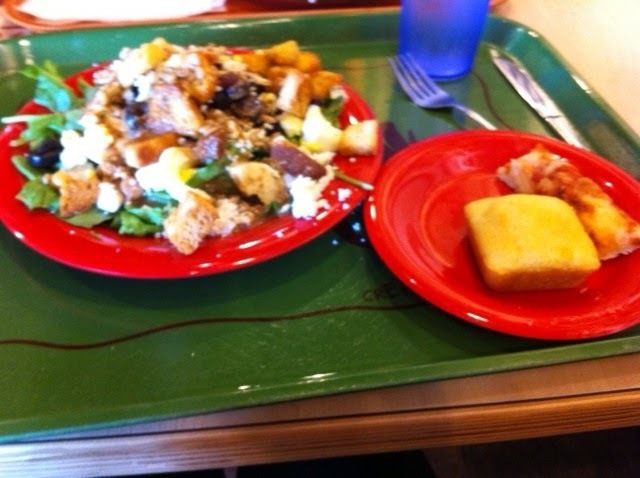 I really liked Sweet Tomatoes and definitely plan on going back many many times! The salad was awesome, although I may try a different dressing next time. I also plan on better portion control, since I had such a monster salad and I hate wasting food, I only tried a couple things other than the salad. It makes me feel somewhat healthier having a salad, as long as I get a dressing that isn’t a billion calories (good thing I don’t like ranch). What restaurants do you like? Any new finds?